SOLID STAND SEEDERS:Solid Features...Solid Stand. The Land Pride Solid Stand Primary Seeder’s innovative design combines Land Pride quality with Great Plains grain drill technology. Engineered for precise seed metering and excellent seed placement, this tool can be used to plant a wide variety of grass seed in prepared seedbeds. The Primary Seeder’s double roller system provides soil-to-seed contact for superior germination and emergence. Seeds distributed between the rollers and released in a full width pattern. The front rollers, comprised of 12 inch diameter cast iron rings, create an ideal seedbed by pulverizing cloded sand forcing rocks and other debris into the soil. The 9 1/2 inch diameter rear roller is spring loaded for constant downpressure; firmly pressing the seed into the seedbed at just the right depth. The rear rollers are staggered to run down the center of the front row pattern, leaving a precision planted seedbed. 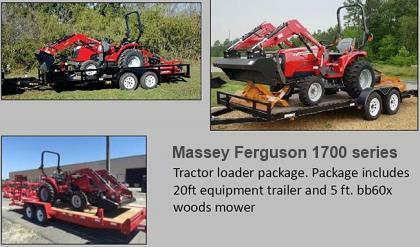 ROTARY TILLERS: All four series Rotary Tillers feature heavy duty cast iron gear boxes for years of dependable use. Their tubular steel box frame makes them the industry leader for rugged performance. A fully enclosed oil bath lubricates and adds life to the driven chain. Every Land Pride Rotary Tiller offers either side shift or offset capabilities for maximum flexibility. Adjustable lower clevis hitches allow you to match the rotary tiller to your tractor hitch for easy hook-up. The adjustable reinforces rear deflector can be set to level tilled soil for a garden-perfect seedbed. Land Pride Rotary Tillers have the feature and design appeal unavailable on any other domestic tiller. PTO POWERED RAKES: Land Pride continually tries to improve their products so that the operator benefits the most. We have done so with our new PTO Powered Rake. First, we have moved the center of gravity forward resulting in a decrease of 1,000 ft. lbs. (96" model) at the 3-point of the tractor. This makes it more maneuverable and compatible to a larger selection of tractors. Second, we have spiraled the roller bars. This helps eliminate the jumping and pounding on extremely hard soil. Third, we added double strand 50 chain.This is an increase of 150% in strength over our previous model. It works in conjunction with the spiraled roller to decrease slack and jump in the chain. ROTARY CUTTERS: There are 3 series in the line of Land Pride Rotary Cutters to meet your specific needs. Including models in the 4 foot - 6 foot range and the tough medium-duty 5 foot to 7 foot also, the rugged heavy duty 5 foot to 10 foot, and handle tractors engines from 60 horse power to 120 horse power. The cutters also feature Floating Top Links and Protective Front Skirting. The reinforced deck slopes toward the rear to prevent flying debris. GROOMING MOWERS: Land Pride Grooming Mowers are the new standard in finishing mowers, with a combination of superb mowing quality, structural strength, and operator convenience. Both Flat Deck and Air Tunnel Grooming Mowers offer superior standard features and a complete line of options for the finest mowing quality. Our Grooming Mowers feature a floating hitch block and a pivoting top link that allows to follow ground contours each mower deck is constructed with 3/16 inch steel plate and the blades are 1/4 inch high-tensile, heat-treated steel. A welded steel chassis absorbs shock loads instead of the deck. PARALLEL ARM CUTTERS:Designed for pond and roadside embankments, ditches, fence rows and many more hard to reach places, the Land Pride 5 foot Parallel Arm Cutter offers features to make these mowing conditions simple, as well as less time-consuming. The Parallel Arm design of this cutter allows the operator a great deal of flexibility. With other “boom” type cutters, anytime the arm cylinders are activated the angle of the cutter deck is altered. With parallel linkage designed into our arms, changing the arms to clear an obstacle does not change the altitude of the cutting deck. LAND PRIDE FEATURES & BENEFITS MANUAL: Click here to download the complete product line in Adobe PDF format.